Neil Young's new album, _Sleeps with Angels_, is one of the best he's ever made with his on-again, off-again collaborators in the band Crazy Horse. It is also one of the most unusual. In the past, Young has generally turned to the band when he wanted to blast full-bore, electric-guitar rock-and-roll, but for his softer, more reflective stuff he has more often worked with other musicians. Not so this time; there are other acoustic instruments all over the place-folk guitars, rinky-tink pianos that sound like what you hear in old Western movie saloons, flutes (!) - and it isn't until the sixth song, the 14-minute epic "Change Your Mind," that anything like Young's signature electric squeal comes to the fore. Sonically, _Sleeps with Angels_ is something of a departure as well, recorded (I assume deliberately) so that it sounds as if the music's being picked up by one or two microphones at opposite ends of a long, empty room while the band jams unawares. I guarantee you haven't heard such unconventional instrumental balances (distantly miked drums, rhythm guitar way out front of the lead) since, oh, the last time you used that little shirt-pocket portable to tape your favorite local garage band playing live at the VFW hall. That kind of studied primitivism disguises a canny sophistication, of course, and (predictably enough) what the album does have in common with Young and Crazy Horse's previous work is extremely interesting songs and a consistently vivid atmosphere. Here, for example, in meditations on urban decay like "Driveby" (as in shooting) and "Safeway Cart," the guitars let you practically feel the miasma of heat and paranoia rising from the Los Angeles sidewalks. On the title song, which most will read as a farewell to Nirvana's Kurt Cobain, Young manages a tone of rueful regret that miraculously skirts the mawkish while the band makes delicate-yet-grinding industrial noises. And in "Piece of Crap" he revs up the tempo for a funny, angry, punk-style indictment of rampant consumerism. The rest of the album maintains an almost magisterial mid-tempo calm. 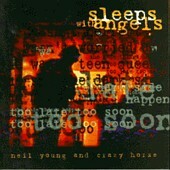 If music can be both soothing and abrasive, _Sleeps with Angels_ is it. Ho hum. Another year, another brilliant Neil Young album.